Greenhouse horticulture is the production of horticultural crops within, under or sheltered by structures to provide modified growing conditions and/or protection from pests, diseases and adverse weather. 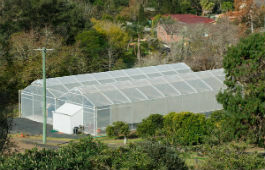 In its broadest definition, greenhouse horticulture includes the use of greenhouses and glasshouses, shade houses, screen houses and crop top structures. Controlled environment horticulture (CEH) is the most modern and sophisticated form of greenhouse horticulture. It is sometimes referred to as "controlled environment agriculture". CEH combines high technology greenhouses with hydroponic (soilless) growing systems. CEH makes it possible to consistently and reliably control or manipulate the growing environment and effectively manage nutrition, pests and diseases in crops. NSW Department of Primary Industries conducts research, advisory and education programs into production systems with the aim to increase profitability and productivity and assist growers to attain world's best-practice in producing high-quality, high-value fresh produce in sustainable systems.